I made this quite a long time ago, but I’ve been putting off writing about it because it didn’t go as well as I would have liked. Whilst it tasted lovely, it didn’t look right and I am nothing if not a perfectionist. But anyway. 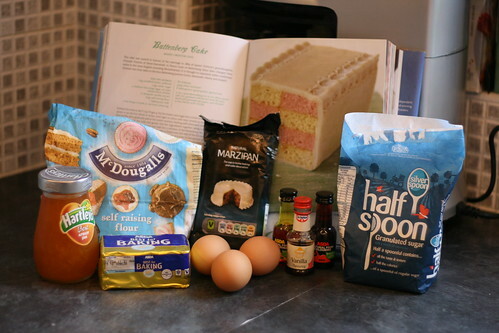 I wanted to try it because Battenburg cakes are so pretty and because it would be a bit of a challenge. Boy, was it a challenge. But like I said, it tasted just fine and my parents certainly had no complaints about it. It was just me and my perfectionism that made me not like it. 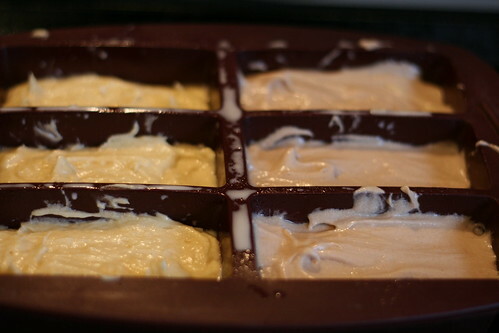 Pre-heat the oven to 180C and beat the butter and the sugar together until the mix is very pale and very creamy. 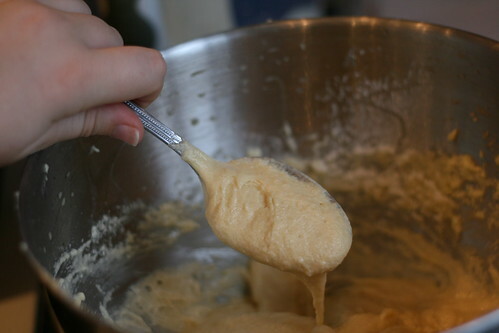 Beat the eggs and mix in the 1/2 teaspoon of vanilla, before slowly adding them to the butter and sugar mix. Make sure that you beat the mix together well after each tiny egg mix addition. 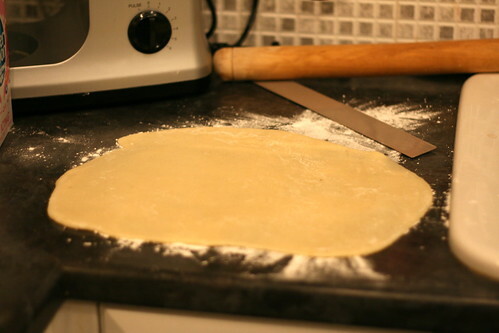 The sift the flour into the bowl, add the milk and fold the ingredients together. You should end up with a thick cake batter. 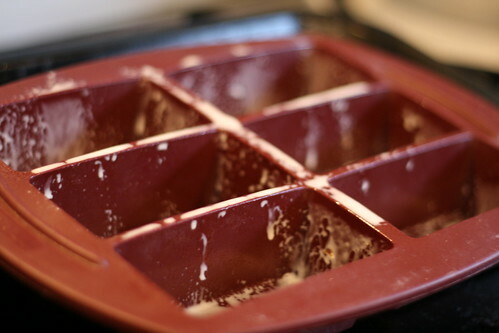 With the remaining half, add pink or red food colouring to it a few drops at a time and put it in the other half of the cake tin. Okay, so the ones on the right look a different colour to those on the left, but they are not bloody pink! They are not bloody pink! Still. Never mind. Onwards and upwards. 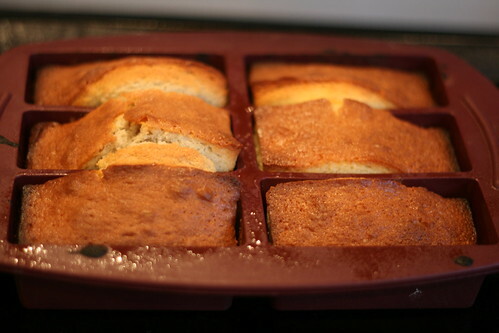 I turned them out onto a wire rack and left them to cool. 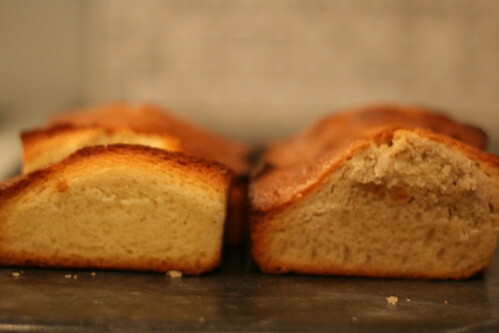 When they had cooled completely I trimmed them so that they were as even as I could make them and then cut them in half, because I wanted an 8 section cake rather than a four section cake. 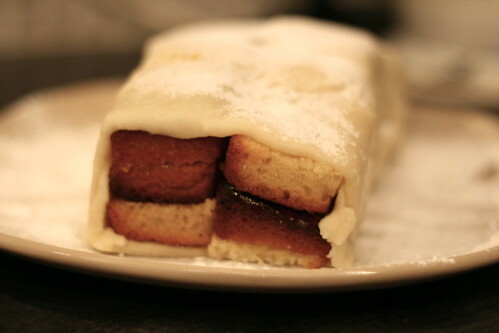 Then I took my pack of marzipan and rolled it out on a surface that I’d dusted with icing sugar. 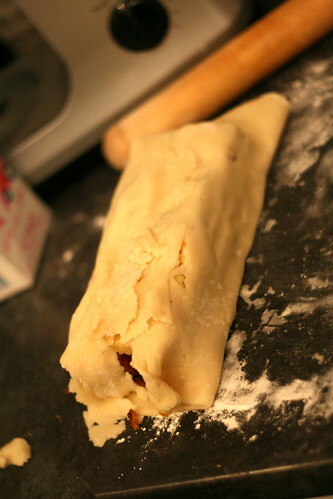 It’s supposed to be, according to the recipe, a rectangle measuring 20cm by 30cm. Add a tablespoon of boiling water to your jam and push it through a sieve so that it’s a smooth puree. 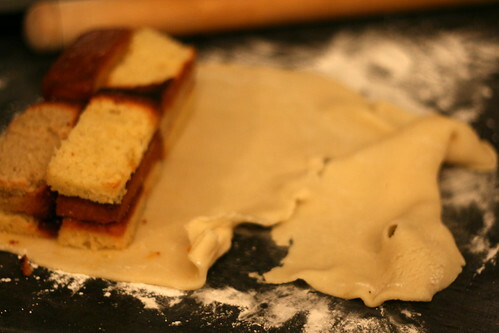 Then use a pastry brush or a clean finger to brush the jam on the long sides of the pink cake, and then set it down on the marzipan. Do the same with a yellow strip and put it on top of the pink one. Do the same with another yellow strip and put it next to the yellow one. Keep doing this so that you end up with a checkerboard pattern of pink and yellow. 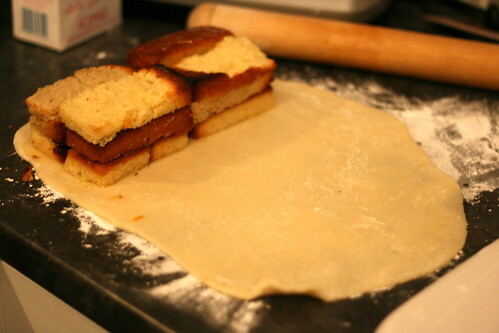 The recipe says to then “Wrap the marzipan neatly over and around the whole cake, leaving the ends visable” Okay. That happened. A lot. I ended up doing a lot of patchworking. I think that looks like a diseased organ. Thankfully the bottom looked better. I don’t think it helped that the cake wasn’t sticking together properly. If I do this again (If? 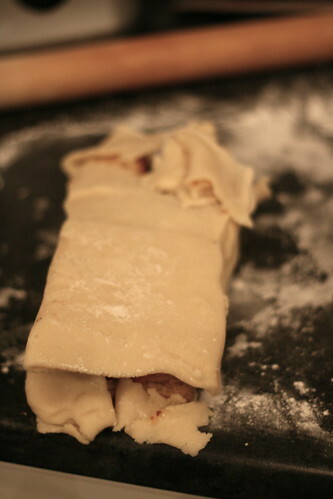 WHEN I do this again; I want it perfect) I’ll leave the cake to stick together a bit. Anyway. 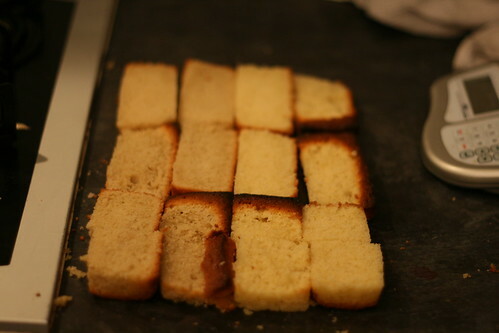 Trim of the excess marzipan and slice off the ends to neaten. And…voila. Like I said, it tasted fine. It just didn’t look good. Considering I sliced all the bits in half to try and do an 8 section cake, I have no idea why it looks like it only has 4 section. I think this cake was just generally a bit of a balls up. 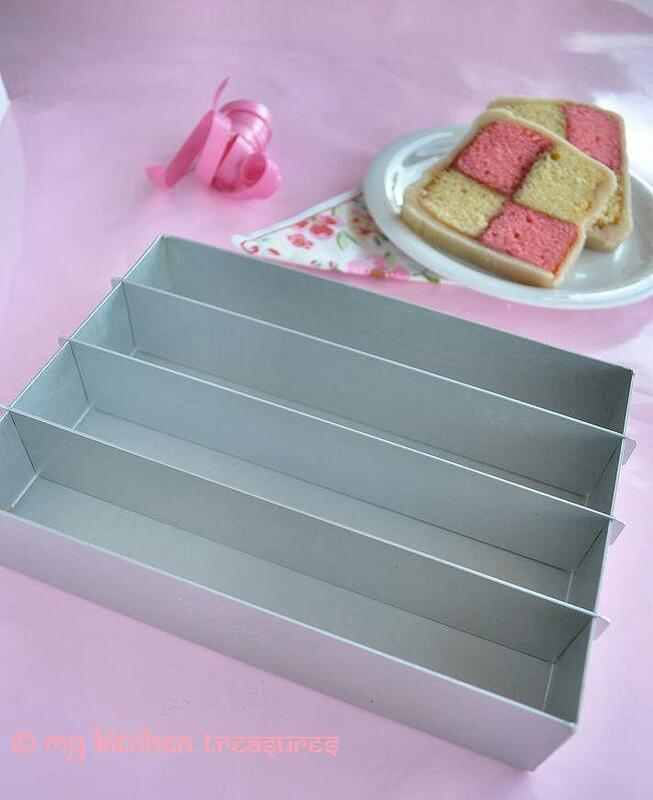 I may try it again, but with a proper Battenburg tin and with cochineal food colouring rather than ASDA’s own. There’s a Flickr photoset here, and please don’t be put off by this hideous walkthrough. It’s my skills lacking here; not the recipe.